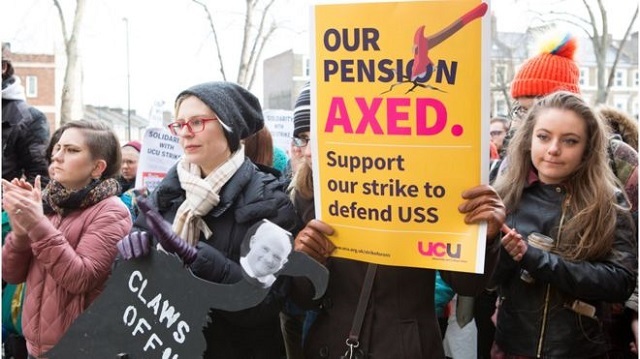 Since early February, the University and College Union (UCU) and the employers’ association for pre-92 UK universities, Universities UK (UUK), have been locked into a bitter battle over pensions in the UK Higher Education sector. Overall, 14 days of strike action have been scheduled for February and March (see Lecturers on strike), and staff at 64 universities have joined the strike to date. As was the case in similar disputes three and six years ago, an apparently large deficit in the USS pension fund is at the heart of the dispute, and has been used by the employers to demand major cuts. To address the deficit, the employers want to drop the current defined contributions scheme whereby every staff member knows what pension they can expect upon retirement, in favour of a defined contributions system in which pensions depend on the uncertainties of the stock market. In addition to pushing the risk onto employees, it is estimated that this proposed defined contributions system implies a loss of up to £10,000 per retirement year. First, they have underestimated the resolve of staff in Higher Education to stand firm and carry out extended industrial action, despite the heavy salary losses involved. At my own institution, the University of Nottingham, never before have we been able to mount this many picket lines across the various campuses. 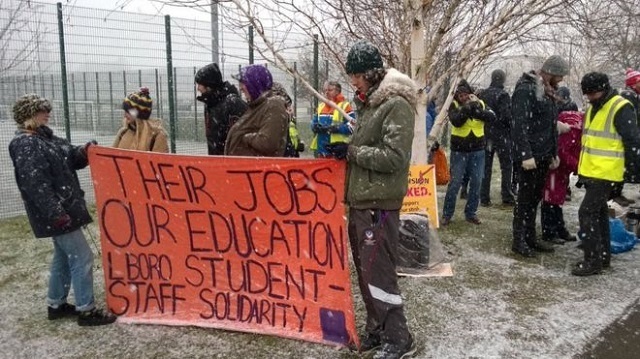 Day after day, we have had four picket lines on University Park campus, three on Jubilee Campus, one on King’s Meadow Campus and one on Sutton Bonnington campus. Moreover, never before have the picket lines been this large with, at times, more than 30 people congregating on individual pickets. The picture is pretty much the same at other institutions across the country. Second, university management have seriously misjudged the resolve by UCU to maintain the pressure of industrial action. Unlike three years ago, when our national leadership caved in prematurely (see The Great Pension Robbery – UCU unravelling), this time round the mere offer of renewed talks was not used to call off action. On the contrary, this time members were asked to continue striking — and so we did. The mood on the picket lines, as well as at UCU Head Office, is clear: until we have concrete proposals for an alternative solution on the table, we will not stop engaging in industrial action. ‘As representatives of the student population we stand with UCU as they take industrial action and urge you to show solidarity too. You can do this by writing to the Vice Chancellor to tell her your concerns, or joining our academics on the picket line during strike days’ (SU Nottingham University, 7 February 2018). Additionally, the Students’ Union drew up a model letter for students to send to the VC, to demand she put pressure on UUK to re-engage in meaningful negotiations. This supportive stance has been replicated across a range of student societies and significant numbers of students on picket lines. Again, the picture is similar at other Higher Education institutions and campuses. 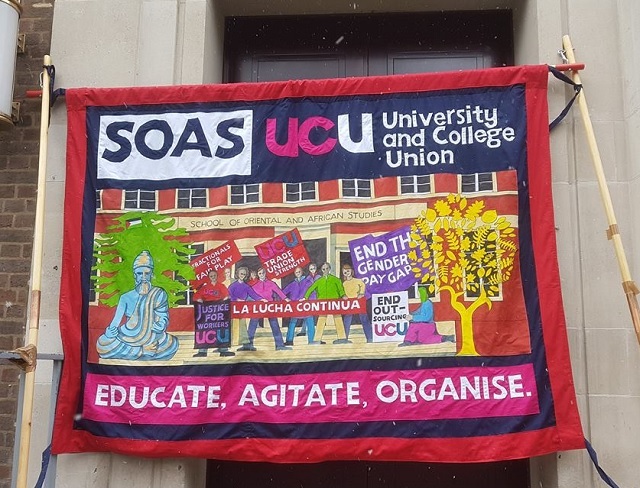 At universities in Bath, Bristol, Leicester, Liverpool and London, students have even occupied the VCs’ offices to underline the seriousness of their opposition to pension cuts. Finally, university managements have failed to understand that there is a change in wider British society. With Jeremy Corbyn becoming leader of the Labour Party and the party’s much stronger than expected performance in last year’s general elections, there is a broader shift towards a focus on social justice issues. Poverty wages, poor working conditions and pension cuts, and continuing austerity in general, are all less and less accepted by large parts of the population. Student support for the strike comes against the background of increasing concerns over high tuition fees, student indebtedness and the fact that the Labour Party has acknowledged this in its Manifesto pledge to abolish fees. Times are changing and university managements around the country are learning this lesson the hard way. Considering the developments of the past few weeks, a victory for UCU members has become increasingly likely. Nevertheless, while academics may be able to protect their pensions, defending Higher Education as a whole against further marketization is a more difficult task. High tuition fees, increasing casualization of the workforce, downward pressure on salaries and pension cuts, are all part of the same process, making Higher Education attractive to private sector investment. Clearly, the struggle has to carry on beyond the protection of pensions. Like a lot of academic writers on the subject you have missed out a significant element of the pension debate. (Not that I wish to argue against your piece rather to add to it). The professional services staff whom you rely so heavily on and who are at the front line. Largely non-management student facing see things slightly different, arguably fresher. For a start the vast majority (I know not one) university includes non-academic and non-management (earning largely well below £24k pa) in the USS pensions’ scheme. Our scheme attracts a much lower employer contribution, a figure that will vary from university to university no doubt. We are under the local employment pool, the local catchment and have less agency that academics who are internationally or nationally sought. Easy to hire and fire. Our position is much weaker. This divide another one of those hang-overs from the past, elitism that was enabled and still it seems accepted in the sector. The opportunity was there to present a pension scheme for all, but it wasn’t offered, in contrast ours was sacrificed a year or so before, much more quietly was this cull, with no strike action to note of, and not utterance from our academic colleagues when we lost our defined salary benefits. Did the unions raise the question of the division between the academic and non USS divide? No, not at all. Why would an inclusive university sector differentiate so much between us, because it can afford to do so. Of course this sounds like a bitter response and perhaps it is, but more accurately it is a frustration over this notion of fairness that was the banner of the protest, the cut is much deeper than the opinion pieces so far have described, you’ve missed an important leg of the organisation. I have not seen one academic really write about the big picture here, I think the analysis has been limited to under their nose. And yes the students did support you, in the main, at the beginning. But as the strike wore on and the prospect of exams loomed closer different conversations were held. I know I was there listening to them, trying to reduce the kick back and prepare for the academic return. What I would have liked would have been to see a voice that was truly inclusive and questions as to how you can value one sector of the university community over the other, as we are in 2018 not 1918. Your benefits might have been cut, but ask your administrator when you next file the expense claim what their employer contributions are and challenge the union by asking were they not worthy also?